Last night, the USL 1st Division's Atlanta Silverbacks went into Pizza Hut Park and almost upset FC Dallas of MLS . Tonight at PAETEC Park, the Rhinos hope to do one better than the team that they will play on Saturday as they host the New England Revolution. The Rhinos will have revenge on their minds as the Revolution bounced the Rhinos from the 2006 edition of the Lamar Hunt US Open Cup Tournament. If you were there that fateful night, you will remember Scott Vallow keeping the Rhinos in the match, the Rhinos and Revolution playing 120 minutes of thrilling soccer, it going to PKs, the Rhinos getting up 2-0, and then falling apart as they lost in sudden death PKs when Frankie Sanfilippo missed for the Rhinos and Jeff Larentowicz converted for New England. The Rhinos will likely have to rely on a goalkeeper that has only two training sessions with the team as newly signed Portugese goalkeeper Nuno Santos is the likely starter in goal for Rochester. New England may have a surprise in goal, as well. MLS All-Star Matt Reis could be given the night off by head coach Steve Nicol. Doug Warren could be in goal for New England tonight as the Revs are looking to given Reis some rest. Warren did not play in a single MLS match last season and has yet to see MLS first team action in 2007. Add in that Taylor Twellman may not start coming off of US National Team duty at the Gold Cup and Copa America and Jamaican international midfielder Shalrie Joseph likely sitting this one out due to injury and the Revs may have some serious manpower issues this evening. Although, I doubt their issues will be anywhere near as severe as the Rhinos. Hamed Diallo and Rey Martinez are the Rhinos only available forwards at this point with Matthew Delicate (broken jaw) and Mike Ambersley (bruised foot) out injured and Chad Severs cup tied to the Harrisburg City Islanders. Add in various injuries throughout the Rhinos midfield (Ryan Wileman), defense (Nate Craft), and in goal (Scott Vallow and Hector Zapata), and it's clear that the Rhinos are nowhere near 100% for tonight's match. However, when it's a one and done match in a Cup competition, you never know what can happen. That's why I can't wait to get to PAETEC Park tonight! 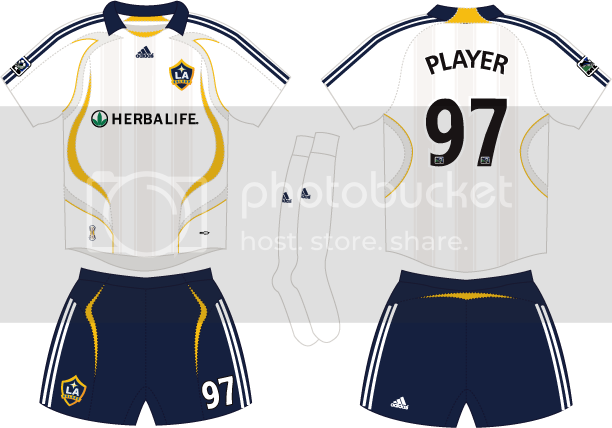 - The LA Galaxy's new colors are leaking out on the internet. Whether it's a shot of Beckham's dark blue jersey, a front shot of their new white jersey, or a leak of the adidas template for their new home kit, the pictures are everywhere. Personally, the new crest is a little plain. But, the overall look of the jerseys and the home kit are pretty sharp. I just hope this new look sticks for a while as I can't stand it when teams are constantly changing the overall look of their uniforms. - Some more big names being linked to MLS clubs are Brazil's Denilson and Nigerian and former Bolton Wanderers midfielder Jay-Jay Okocha. Real Salt Lake was unwilling to throw Designated Player money at US goalkeeper Kasey Keller. But they may have been willing to throw Designated Player money at Okocha because he'll add to the Real Salt Lake attack. 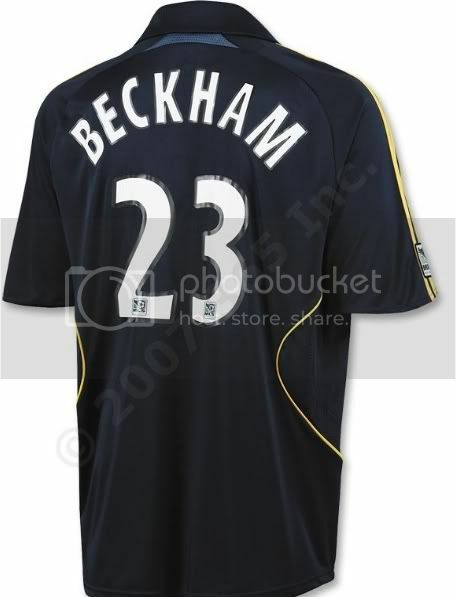 - The Houston Dynamo should have a very happy DeRo on their hands now. Canadian international Dwayne De Rosario wanted to get paid and the Dynamo have finally rewarded him with a contract extension. My guess is that a happy DeRo will be a very good thing for Houston and a very bad thing for the rest of MLS. I've been asked by a lot of people lately when the roster freeze date is for this season. Well, the answer is three weeks from yesterday. The other question I keep getting asked is what could the Rhinos be up to? I think it's obvious that Hector Zapata should not be investing in a home in the greater Rochester area any time soon. However, moving the current third string and eventually fourth string goalkeeper, isn't likely to much of anything beyond open up a roster spot on the 26 man roster. While it's obvious that the Rhinos aren't shopping Johnny Menyongar, there aren't a lot of other guys on this roster that have ties to other USL 1st Division teams. Aaran Lines has played previously with the Portland Timbers. But, the Timbers are currently playing well and could be a potential playoff opponent of the Rhinos. So, would either team want to help each other. I would get a chuckle out of a Lines for Dombrowski and Bagley deal, however. That would be a former-Timber heading to Portland and two former-Rhinos headed to Rochester. The other option could be simply buying out contracts of players that are unlikely to play again this season. Does defender Nate Craft fall into the boat? If Mike Ambersley and Ryan Wileman continue to struggle with injuries, could the team possibly cut them loose and re-sign them in the offseason? Again, these are all just possibilities I'm throwing out there without any knowledge of what the Rhinos are up to. But these are just a few of the more obvious things that might happen between now and July 30th.